Reliant slings come in a wide array of styles to meet a variety of client needs. The full-body slings have four point hook up and a commode opening to accommodate toileting. 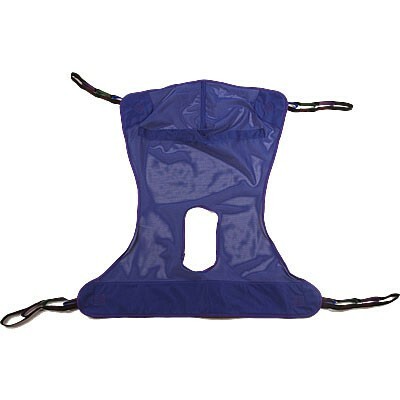 The soft mesh fabric dries quickly, so slings stay in service. And the new stretch-resistant feature means the slings will hold their shape, for superior support and ease of positioning. For clients and caregivers alike, Reliant slings are designed with comfort and safety in mind.Reliant slings feature a unique, fully padded fabric that forms a soft yet supportive surface. The soft-brushed lining helps prevent sliding for ultimate comfort and skin protection. And the new stretch-resistant feature means the slings will hold their shape, for superior support and ease of positioning. For clients and caregivers alike, Reliant slings are designed with comfort and safety in mind. The soft mesh fabric dries quickly, so slings stay in service. Stretch-resistant feature means the slings will hold their shape. Superior support and ease of positioning. Medium, full-body w/ commode opening. Is there a weight scale that can be attached to this hoyer model? Hoyer carries many patient lifts that have the option of purchasing a weighing scale. We recommend finding a hoyer patient lift that works for you and search for a scale attachment from there. I agree that it is hard to figure out a size. I got the extra large but feel it is too big also. I'd like the handles that attach to the lift to be softer, feel too stiff. Maybe in time after washing a few times. It is OK. Serves it's purpose. I have another sling that has a total of 6 handles and I feel that holds my husband better. I also think this sling is too large. I found it hard to choose a size.